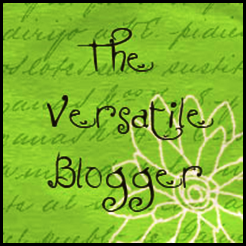 ← You Can Subscribe To My Blog On Kindle! Those of you who read yesterday’s post, Now the second day, will remember that by the time I pulled out of the driveway headed to work I was somewhat discombobulated. This sensation only increased when I realized that the garbage can was not out on the curb for trash collection. 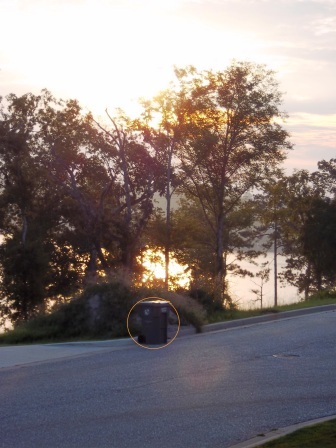 I should have realized that yesterday was garbage collection day, because I had been given a clue – the sunrise pictures I took yesterday included photos of my neighbors’ garbage cans out on the curb. A Clue for the Clueless! However, I did manage to forget, so was aghast to see the garbage can in the driveway as I pulled out. In our household, going two weeks without garbage collection usually leads to a certain amount of desperation. No matter how hard we try, we just can’t cram two weeks worth of stuff into the bin. Fortunately, I found out this morning that my ultra-organized husband had not only put the garbage can out on the street for pickup Tuesday morning, but had gone ahead and taken the can back in since it had already been collected by the time he was ready to leave for work. The idea that garbage collection is a necessity is a relatively new one in human history. For centuries, humans did not worry about waste disposal; they either piled the waste in one spot, burned it, or, most common in cities, just threw it in the streets. Interestingly, it was Benjamin Franklin (surprised?) who formed the first street cleaning service in 1757 and who encouraged the public to dig pits to dispose of their waste. It wasn’t until the late 1800’s to early 1900’s before cities started to really focus on waste collection. Even then, as the photograph above shows, there was not a lot of concern about where trash was dumped; it was dumped in any open field, wet land or watercourse that seemed convenient. FN. Once the internal combustion engine was invented and harnessed for transportation, it didn’t take very long for the garbage collection truck to be invented as well. The truck above is from the early 1900’s. It posed problems for garbage men, though, because it required the person picking up the trash can to lift it over his head. 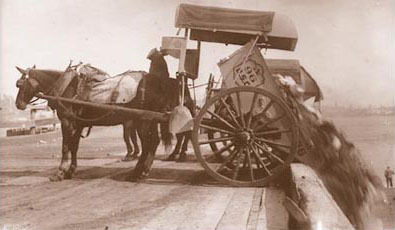 The rear-loading garbage truck was invented as early as the 1920’s. 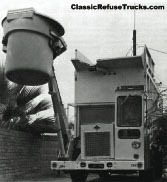 A similar model is still used to pick up my garbage today, although hydraulic lifts and other mechanical improvements have been added to make it easier on the garbage collector. 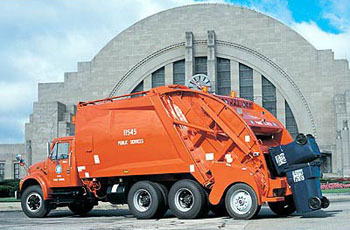 Between the 1920’s and today, of course, many other forms, shapes and sizes of garbage trucks were tried out. The next one is one of my favorites; using it taught the garbage industry that bigger is not always better! My family has not had to resort simply to imagination to experience what it would be like today if there was no garbage collection. The first two years we lived in our house, our neighborhood was so new that when replacement drivers would come in around Christmas time, they just forgot about us. You don’t realize how desperately important trash collection is until you go three weeks without it with a five/six-year-old girl at Christmas time. By the time we heard the garbage truck that second year after Christmas, Mark and I both flew out of the house, chased it down, and held the garbage men there in conversation while we not only got them to empty our can, which was full to overflowing, but also sweet-talked them into taking the other seven garbage bags we had been forced to store in various and sundry places. Actually, there wasn’t a lot of sweet-talking involved – we just kept grabbing bags and chucking them into the garbage truck opening like madmen. Fortunately, by the third year in our house, even the replacement drivers knew where we were (or word had spread that the crazy people at our house would chuck garbage into the truck no matter what if you skipped us) and we haven’t had the same problem since. However, I have never taken garbage collection for granted after that! So, today or the next week, if you get behind a garbage truck, or when your own local garbage man comes by to collect your trash, give them a friendly wave, and a kind thought. Without them, our homes would be messier, smellier places and they deserve our thanks! FN. 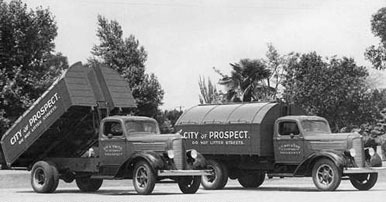 The pictures and historical information above came from Ace Disposal: The History of Garbage Collection. This entry was posted in Just stuff..., On the Home Front, working mom and tagged family, garbage, garbage collection, garbage trucks, housekeeping, humor, trash, working mom. Bookmark the permalink. Great article, Nancy. I always think about what an important service these men and women perform for us. They are truly a valuable part of our day to day lives. Thanks Shana! Untiil you go without garbage service, it is really hard to realize. Wow, very interesting. We have garbage trucks here in Tbilisi and we also have lots of street sweepers (usually little old ladies with handmade brushes). I will ask the tall person to take some pictures of them. That would be very interesting to see Bassa!